An emerald and white gold ring with pave set diamonds. We all want the best, but if you are like most of us, your jewelry purchases are constrained, not by your taste or imagination, but by your means. Only the wealthiest connoisseurs can afford emeralds that approach perfection. To be affordable, you may have to make a selection that results in a compromise between an emerald’s cut, clarity, color, or carat weight. Just as gem cutters made choices as they worked with individual gemstones, you should choose the gemstone that conforms to your personal preferences. A stunning emerald and platinum diamond necklace. For example, if you value color over all other quality characteristics but have limited means, you may have to settle for an included stone or a less-than-perfect cut. Although the four “Cs” of emerald quality were discussed elsewhere on this site, we have a few additional tips we’d like to pass along to you. We know you will find them helpful when you make your next purchase. First and foremost, you must be prepared to shop and compare. Before you buy, it is important that you look at a wide range of gemstones and compare their cut, clarity, carat weight, and color. Discuss quality with the salesperson. Make sure you watch for the use of emerald misnomers. Do not be fooled into thinking that you have to buy an emerald from a famous mine or country. When judging prices, make sure you are comparing stones of equivalent size, color, and clarity. Make sure you ask the salesperson what treatments have been applied to the stone. They are required to disclose all known treatments to you the consumer. Gather information about the extent and nature of any fracture filling . The least expensive emeralds are frequently treated with epoxy fillers because they are durable and effectively mask heavily fractured stones. 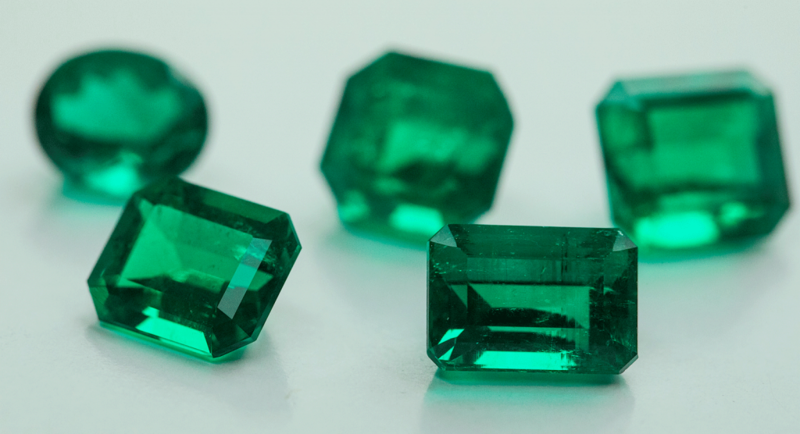 If your emerald is priced in the thousands of dollars, you should inquire about the extent of fracture filling and whether a colored or tinted product was used. If your emerald is worth tens of thousands of dollars, you should expect the salesperson to be able to tell you the amount of clarity enhancement the stone received and what type of filler was used. Knowing how to describe gemstone cutting styles and the components of a faceted stone. Knowing what features to look for when evaluating a stone’s proportion and finish. What shape gemstone do I want? Do I like cabochons or faceted stones? What cuts appeal to me? Is the overall shape of the gemstone attractive? Is the overall symmetry and proportion pleasing to the eye? Are the facet edges crisp and sharp? Is the gemstone’s surface smooth and shiny or does it have scratches, chips, or other blemishes? Learning how to loupe a stone. Learning what inclusions to expect in natural emeralds as opposed to synthetic emeralds. Have I found the best color for the price? Does the stone have visible color zoning? Does the stone show significant windowing or extinction? A large, oval-shaped emerald set in a gold and diamond ring. Item Three: Learn how to discuss emeralds in terms of their per-carat price. This will give you the means to evaluate and compare different stones from different dealers. Does the metal hold the stones securely? Is the metal holding the stone thick enough, strong enough, and even enough to survive wear over time? What is the quality of the craftsmanship? Are there any rough areas that could catch on clothing? Are any of the stones chipped or crooked? Are the stones level and flat or do they overlap? The famous Anna Case McKay necklace set with a massive emerald pendant, designed by Cartier. Item Two: Check the soldering on all parts of the mount. Precious metal jewelry is often constructed from elements created by different jewelry manufacturing methods including a combination of die struck, cast, electroformed, and hand fabricated components. When these pieces are assembled correctly, the solder joints should be invisible. When done incorrectly, solder joints can be cracked or have areas where excess solder is evident. It is not uncommon for poorly soldered joints to break with only minor wear or when cleaned in ultrasonic jewelry cleaners. Poorly soldered areas can also discolor over time. Sometimes inappropriate solders are used during manufacture or repair. Although it is not good practice, pieces may be soldered with cheaper, low karat solders that tarnish over time. This is caused by a chemical reaction of the alloying metals with our skin oils, perspiration, lotions, and other cosmetics. Remember, soldering is important; it can alter both the beauty and durability of a jewelry item. Unique emerald and diamond teardrop earrings. Item Three: Check for porosity . Pitted metal is naturally weaker than smooth solid metal. Excessive porosity can threaten the durability of your jewelry. The main causes of porosity are improper casing, improper soldering, and impurities in the metal. Be wary of jewelry made from scrap gold, it often contains old solder and other impurities, which can create cracks and porosity in newly cast items. Although it is an unacceptable practice, porosity can be hidden by solder and textured finishes. Make sure you look carefully at your piece; look for gaps, holes, and small pits, especially on the backside. Item Four: Check the finishing. Very fine jewelry looks as good on the backside as it does on the front. Mass produced pieces may be rough on the back, but the visible upper surfaces should have a consistent polish or texture. There should be no evidence of tool marks. Details and edges should be sharp but smooth. Well-made jewelry should not scratch or catch on clothing. Emerald often served as a complimentary feature to diamonds in Art Deco jewelry like this ring. Item Five: Is the jewelry hollow or solid in construction? Hollow jewelry looks big and heavy, but it feels light. It will cost significantly less than a solid piece. Hollow jewelry is produced by certain manufacturing techniques including electroplating. It is often used in the manufacture of earrings. While there is nothing intrinsically wrong with hollow jewelry, it can dent easily and be difficult to repair. Do not select a hollow piece of jewelry if you anticipate that it will get extensive wear. Item six: Does the precious metal chosen for the mount enhance the color of the emerald? 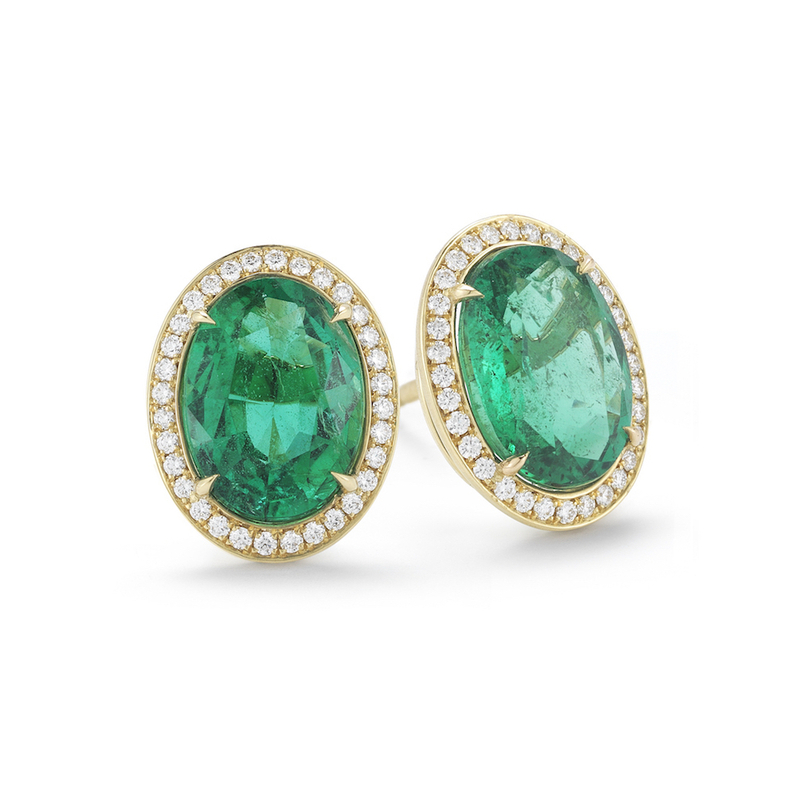 An emerald’s extraordinary value means that it is set only in the most precious of metals: silver, gold, and platinum. Each of these metals complements emeralds in a different way. Although you may choose to follow the advice below when selecting the color of the precious metal to house your exquisite emerald, remember that beauty is subjective and there are no absolute rules. You may forge your own path as you create your own highly personal heirloom. If you are interested in New Age Metaphysics, you may also be influenced by the fact that each of the precious metals has its own special qualities that can enhance the inherent “virtues” of your emerald. Emerald and diamond stud earrings with a flower-like halo. Though silver is now common and affordable, it was once coveted as much as gold. Emeralds are rarely set in silver today, but until about four hundred years ago, both were frequently used to create crowns, scepters, and other royal regalia. With its silky glow, silver–and even slightly tarnished silver–can flatter an emerald. Yellow gold and rose gold have both been used to mount emeralds, although they are not always the preferred choice. Both of these gold alloys can emphasize the yellowish color of the emerald over the preferred bluish hues. Nevertheless, most experts agree that emeralds appear more intense in a yellow gold mount than they do in a white gold mount. An African emerald ring designed by Faberge. White gold is often used as an affordable alternative to platinum and its aesthetic advantages in setting emerald are similar. Jewelers are continually experimenting with new gold alloys, including green and blue gold–both of which serve to emphasize an emerald’s color. Of the metals regularly used in emerald jewelry, platinum is the most valuable. A truly great emerald will look magnificent in a platinum setting, which makes bluish green colors look cool and tranquil and yellowish green colors look crisp and highly saturated. Once you have purchased emerald jewelry, the next step is understanding how to protect it. We cover that topic next with Caring for Emerald Jewelry.